Four conferences were recently held in four universities and high schools for physical education, through which Sportmeet had the chance to introduce its cultural proposals and sports projects in Argentina. In Buenos Aires and La Plata, over 500 teachers, professors and students got the chance to speak with Sportmeet about a sports perspective and culture able to work in a vision of brotherhood. Among the issues which arose greatest interest there were: education and self-education through sports; the culture of defeat to develop a new victory vision and culture; a proactive relation between sports and mass-media; human and social inclusion and promotion. A new cooperation-based relationship will now be established with the various schools and universities, where Sportmeet teachers are already working. Thanks to the visit to the Casa del Niño in a very poor neighbourhood in Florencio Varela, at the outskirts of Buenos Aires, Sportmeet was able to get in touch with the environment where the last edition of Deporchicos took place. Deporchicos is a yearly sports event promoted by Sportmeet, where children belonging to various social classes play together, with the aim of cooperating to build a better and more united world. 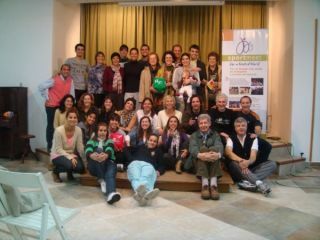 In the last two days of the visit to Argentina, about 35 people gathered at the Mariapoli Lia in O’Higgins, a small city of the Focolari Movement where dozens of youth from all over the world attend a one-year-long brotherhood school, working and studying together. Some reflections on the most important issues, the sharing of many a life experience, an intense dialogue and some relax moments allowed all those taking part in the training week-end not only to feel part of the Sportmeet “family”, but also to renew their commitment to answer, also through sports, to the numerous social questions everyone needs to cope with.